The first cooling system assisted by ARUN solar boiler has been installed at the office building of Turbo Energy Limited (TEL), Paiyanoor, which is about an hour’s drive from Chennai. TEL is a leading manufacturer and supplier of turbochargers to many Automobile Manufacturers in India. The company has undertaken various green initiatives & has been the first certified auto ancillary company under ‘PLATINUM’ category by LEED USGBC (United States Green Building Council). The vapor absorption machine (VAM) installed at TEL, is hot water driven. Pressurized water at 180°C is required for the machine to operate at an optimal level. The return temperature of the hot water is 160 °C. The machine with 40 TR capacity requires 5 m³/hr of the pressurized hot water which can be catered to by 2 ARUN dishes. The solar circuit is kept pressurized at 15 bar using the nitrogen pressurization system. The nitrogen cylinders are connected to the expansion tank in the circuit for this purpose. The cooling system is used for air conditioning of the administration office at the plant. Water is circulated, using centrifugal type circulating pump, through the ARUN solar boiler dishes. The dishes are arranged in a parallel configuration; therefore a single pump is sufficient for water circulation through both dishes. The system is kept pressurized at 15 bar pressure to avoid steam formation within the circuit. The water at 160 °C, from the VAM, is taken as inlet to the ARUN®160 dishes and it is heated to 180°C. The average heat output from the two dishes is about 1,00,000 kcal/hr, which is sufficient for the heat requirement of the vapor absorption machine. NTPC inaugurated India’s largest Solar Thermal enabled air-conditioning / comfort cooling system at NETRA (NTPC Energy Technology Research Alliance), Greater Noida on 29th June 2012. Shri Arup Roy Choudhury, CMD, NTPC, Shri Ashok Lavasa, Addl. Secretary Power and senior officials of Ministry of Power and NTPC were present on the occasion. Representatives from Clique Solar, the company which provided the solar technology for steam generation which is the driving force & executed the project on turkey basis, were also present. "This is a one-of-its-kind installation in the country aimed at establishing technical as well as commercial viability of solar cooling. The JNNSM puts emphasis not only on grid solar power, but on various off grid solar thermal applications as well. Such projects have a very important role in opening up newer avenues for mass replication and thereby facilitating movement towards achieving the mission objectives in letter and spirit. We look forward to great success of the project", said Dr. Ashvini Kumar, Director, MNRE. While leading the nation’s power generation capacity, NTPC’s focus has been on developing cutting edge technologies which will help in reducing costs and safeguard the environment. To this end, NETRA has set up a Solar Energy Research Facility at Greater Noida. As part of this facility, Clique Solar, a Mumbai based Solar Thermal Boiler Company, has installed the world’s largest solar thermal HVAC system with storage. 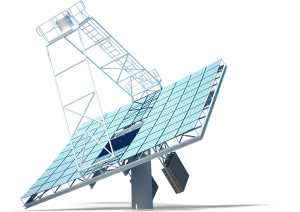 This Solar Thermal air-conditioning or solar thermal air cooling system consists of two dual-axis tracking solar concentrator of Fresnel design, named ARUN®.The ARUN solar boiler provides dry saturated steam at 180°C at about 200kg per hour. The steam is fed to a 50 TR (i.e. about 175 kW of cooling) Vapour Absorption Machine (VAM). In turn, the VAM utilizes the thermal energy of the steam to produce the cooling effect. The distinguishing feature of the system is the storage tank that can store up to 2 days of chilling capabilities. Offices are generally closed on weekends. To avoid wasting the solar energy, this 2-day storage facility has been included. This stored energy can be utilized to provide air-conditioning during lean / non-solar periods or to cool a larger area. The system is also capable of running as a heat pump in winter without any alteration of pipework. This Solar Thermal air-conditioning system is a low carbon, green house gas free air conditioning solution. It has an efficiency of 80%, consumes negligible auxiliary power and occupies less area compared to conventional AC system. For NETRA, improving the availability, reliability and performance of the existing power stations and new power plants is not only a priority but also a challenge. This technology offers an opportunity for replication in power stations. "The ARUN® solar thermal system is the most efficient solar concentrator, both in terms of thermal efficiency as well as land usage. Till date, we have focused on supplying solar steam generating systems for industrial process heat & mass cooking to replace expensive fuels like Furnace Oil, LPG, Natural Gas, etc. However, solar cooling too has an immense potential due to the natural match between the cooling requirement and availability of the sun", said Mr Ashok Paranjape, Managing Director of Clique Solar, a company promoted by IIT-Bombay alumni and channel partners of the Ministry of new and renewable energy(MNRE). 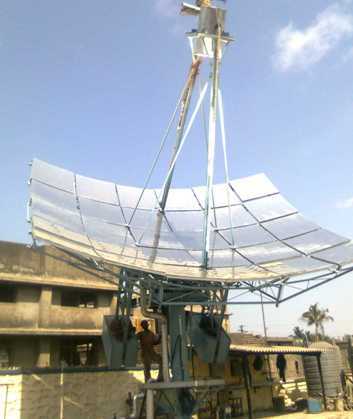 One ARUN®160 solar concentrator delivers about 1 ton of steam per day, while occupying ground area of less than 10 sq.m. It can deliver steam up to 25 bars pressure or thermic oil up to 400°C. Dr. ShireeshKedare, Director and Head of R&D at Clique Solar said, "This project has been commissioned well in advance of the scheduled completion date. Credit goes to the experience our team has gained through the various installations across diverse applications like effluent treatment, milk pasteurization, degreasing process in automobile factory, mass cooking, etc over the last 6-7 years". The vapor absorption machine (VAM) installed at TEL, is hot water driven. Pressurized water at 180°C is required for the machine to operate at an optimal level. The return temperature of the hot water is 160 °C. The machine with 40 TR capacity requires 5 m³/hr of the pressurized hot water which can be catered to by 2 ARUN dishes. The solar circuit is kept pressurized at 15 bar using the nitrogen pressurization system. The nitrogen cylinders are connected to the expansion tank in the circuit, for this purpose. The cooling system is used for air conditioning of the administration office in the plant. The water is circulated, using centrifugal type circulating pump, through the Arun dishes. The dishes are arranged in parallel configuration; therefore a single pump is sufficient for the water circulation through both dishes. The system is kept pressurized at 15 bar pressure to avoid the steam formation in the circuit. The water at 160 °C, from the VAM, is taken as inlet to the ARUN®160 dishes and it is heated to 180°C. The average heat output from the two dishes is about 1,00,000 kcal/hr, which is sufficient for the heat requirement of the vapor absorption machine.